Toronto, October 3, Interfax - The opening ceremony of the first chapel commemorating the Royal Martyrs in North America took place in Jacksons Point near Toronto, Canada. "The event is timed to the centennial of the martyrdom of the last Russian emperor Nicholas II and his family," rector of the church Father Maxim Abroskin said to Interfax-Religion on Tuesday. A year ago Metropolitan Hilarion, the head of the Russian Orthodox Church Outside of Russia, blessed the cornerstone of the chapel, he said. 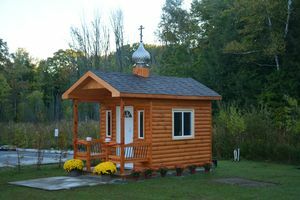 The chapel was built with the donations of parishioners of the local church of the Smolensk Icon of the Mother of God. The prayer service on the consecration of the chapel was led by Archbishop Gabriel of Montreal and Canada of the Russian Orthodox Church Outside of Russia. The opening ceremony was attended by clergy of the Orthodox Church in America and Russia's consul general in Toronto Kirill Mikhailov.